December 2016 - To Feed or not to Feed? January 2012 - Was the Christmas Puffin a Quebecer? 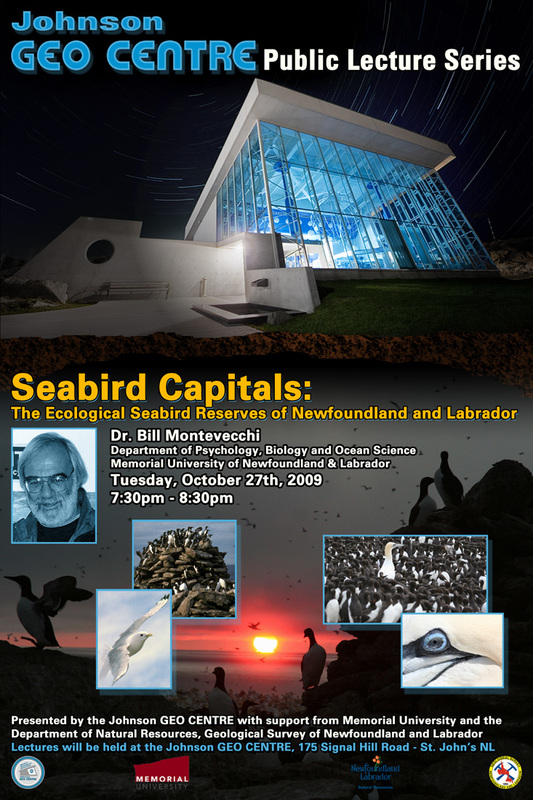 October 2009 - Where Have All the Capelin Gone? May 2009 - Can Economic Analyses Help Protect the Environment? CBC News: " Ocean litter 'disgusting' but scientist says attitudes are changing"
Montevecchi: "Open Letter to Seabird Biologists in the Falkland Islands"
VOCM News: "Millions of Seabirds Vanishing Raises red Flags on Offshore Oil: Biologist"
CBC News: "Researchers Call for Offshore Oil Action as Newfoundland Seabirds Vanish"
VOCM Nightline: "Gillnets, Ghost Nets and Sustainable Fishing Practices"
VOCM News: "Vessel Breached Buffer Zone of Ecological reserve: Montevecchi"
CBC News: "Biologist Slams US Vessel For Running Aground in Witless Bay Reserve"
Northeast Avalon Times: `The Disappearance of Millions of Newfoundland Seabirds"
VOCM News: "Coastal Wildlife and Oil Industry an Imbalanced Equation: Montevecchi"
CBC News: "Offshore petroleum board not fit for environmental regulation, scientist says." The Telegram - Letter: "Oil companies and the CNLOPB - A scandalous relationship." CBC News: "We're doing something wrong: Environmentalist questions central Newfoundland scrap yard." The New York Times - "Hunting 'Turr' in Newfoundland's Frigid Waters"
CBC Radio: The Broadcast - "Are You Ready If a Ship Starts Leaking Oil on Your Coastline?" 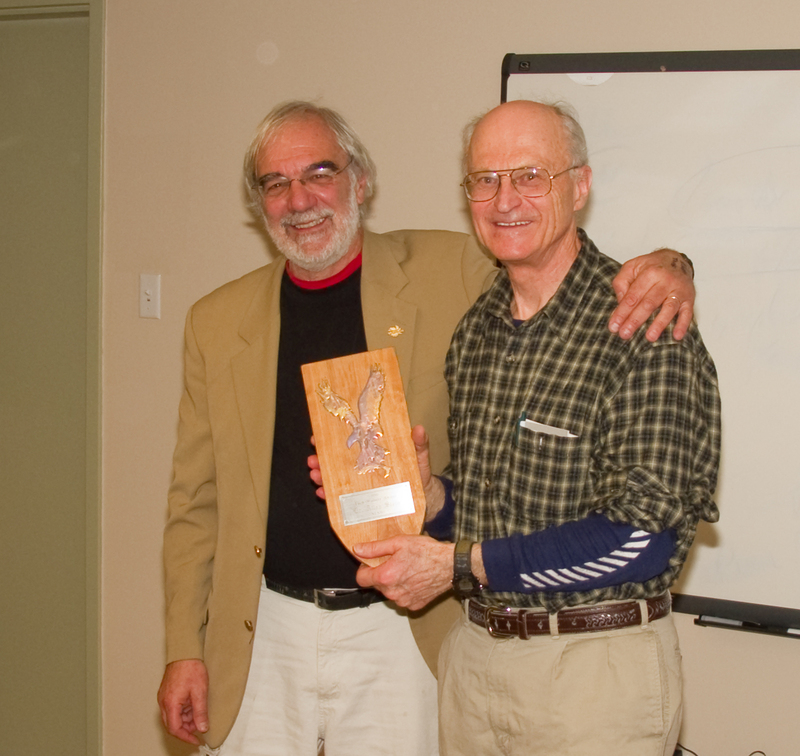 MUN Gazette - "Faculty serving in voluntary capacity to establish N.L. nature reserves"
VOCM News - "Your Birdfeeder Could be Killing Songbirds"
CBC Radio - The Broadcast Interview -"Rethinking the Capelin Fishery and Best Practices"
CBC News - "Scientist scolds 'wasteful' hunters after seabirds dumped in C.B.S"
The Telegram - "Salmonier River Controversy Can be Resolved"
NTV News - "Eagle Snared by Animal Trap in Clarenville"
Brochure - "The Funk Island Great Aux Exhibition"
Letters of Concern and Article- "Ragged Beach Development"
CBC St. John's Morning Show - "Why did the duck WALK across the road?" CBC Shift NB - "Massive Bird Kill Predictable, Says Scientist"
CBC News - "Seabirds Get Comfy at Abandoned St. John's Supermarket"
CBC News - "How a Paradise teen became a wetlands conservationist"
CBC Radio Fisheries Broadcast - "Cod Moratorium, Gill Net Use and Seabird Populations"
CBC Radio Quirks and Quarks - "Gill-net Drownings Depress Seabird Populations"
CBC Radio Fisheries Broadcast - "The Cod Moratorium and its Still-Reverberating Effects on Seabirds"
Nature - "Terrible Toll of Fishing Nets on Seabirds Revealed"
Nature Research Highlights - "Divers Soar After Net Ban"
CBC Radio Noon - "The Coast Guard is Trying to Plug an Oil Spill..."
The Telegram - "Judge Considering Sandy Pond Case"
CBC News Here and Now - "Sandy Pond Alliance Court Challenge"
CBC News Here and Now - "Duck Problems"
CBC Radio: Fisheries Broadcast - "To Cull or Not to Cull"
Juris Benjamin - "Lucky Landing: The Story of a Gannet in Need of Rescue"
Global National - "Warmer Waters and Birds' Changing Behaviour"
CBC News: Here and Now, NL - "Disappearing Gannets"
CBC Radio One: On the Go - "Ted Speaks With Bill Montevecchi About Dive Bombing Crows"
The Canadian Press - "Biologists Call for Action to Stop Multiple Oil and Mud Spills off Newfoundland"
Radio Canada International: The Link! 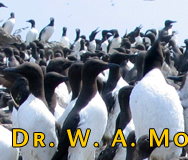 - "Scientist Demands Greater Monitoring of Canadian Seabirds Affected by BP Oil Spill"
CBC Radio: Labrador Morning Show - "Arctic Seabird Presentation"
The Vancouver Sun - "BP spill posed bigger risk to seabirds than believed: researchers"
CBC Radio: St. John's Morning Show - "Oiled Gannets Research Paper"
YouTube - "Funk Island: A Marvellous Terrible Place"
CPAWS News Release - "Scientists Call on Canada to Strictly Protect at Least 30% of its Oceans"
The Telegram - "Time for Change at the Offshore Petroleum Board"
CBC Radio: St. John's Morning Show - "Environmental Audit"
News Video: "Gannets Migrating Into Danger"
CBC News: "BP Spill Threatens a Third of Canadian Gannets"
CBC Radio: As It Happens - "Birds-oil View"
CBC Radio: Fisheries Broadcast - "Sea Birds Affected by Oil Spill in Gulf"
CBC Radio: The Current - "Sea Birds Affected by Oil Spill in Gulf"
The Telegram - "Gulf Disaster Worries Bird Scientist"
CBC News - "Keep Mine Waste Out of Ponds: Activists"
Rotary Club Address - "Privilege and the Protection of the Great Grand Bank Ocean"
CBC News - "Drilling Plan Off Newfoundland Called Unsound"
CBC Radio Morning Show - "Oil Spills Impact"
CBC News - "Low Risk for Newfoundland Oil Disaster: Williams"
CLKB Radio: Ends of the Earth - "Five Reasons to Care About Arctic Seabirds"
CBC News - "Efforts to Save Distressed Duck in St. John's Fail"
Johnson GEO CENTRE public lecture - "Seabird Capitals: The Ecological Seabird Reserves of Newfoundland and Labrador"
CBC Radio: NL Morning Show - "Lawn Islands Archipelago"
NTV News - "National Conservancy Gifts Province"
CBC Radio: Fisheries Broadcast - "The Funks: Bones, Seabirds and Ocean Conservation"
CBC Radio: NL West Coast Morning Show - "Northern Gannets on the Port Aux Port Peninsula"
CBC Radio: Fisheries Broadcast - "Lack of public information on oil spills at offshore platforms"
CBC News - "Researchers feel cold shoulder as polar year project comes to a close"
BBC News - "Warning as Seabird Breeding Fails"
Listen to the audio broadcast of an interview with Dr. Fraser. Read the C-NLOPB's response to the article here. Press Release: "Predicted Number of Atallantic Offshore Oil Spills Exceeded"
CBC Radio Noon - "What areas of the province should be protected from development?" Listen to the audio broadcast of the interview. CBC News - "Production affected by White Rose oil spill"
Parody: "The Front Fell Off"
Watch the video here (Windows Media). CBC Radio Noon - "Economic Boom and Environmental Investment"
Listen to the audio broadcast of the interview and a call from a listener. CBC News - "Ship dumped tonnes of oily bilge off Newfoundland, crew says"
and protection of the natural environment and all its creatures and plants, Dr.
the Newfoundland and Labrador Natural History Society in March. 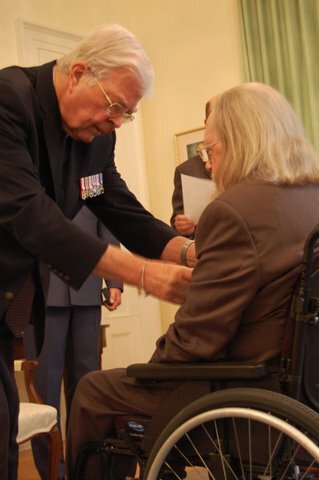 Lieutenant Governor John Crosby awarding Dr. Jon Lien with the Order of Canada, 10 July 2008. For more photos of the ceremony, please click here.